Some Iraqis will miss Saddam Hussein but many more will not mourn him. He brought little but war and suffering to a people who should have been among the most prosperous in the Middle East, given the oil wealth the country sits on. Two groups of Iraqis, the Kurds and the Shias, make up a majority of the population and since the US-led invasion of 2003, they have taken control of the government. Before then, they were the oppressed as Saddam Hussein ruled with absolute ruthlessness through his Sunni-dominated military and intelligence services. The plight of the Kurds became well known around the world in 1988 when the Kurdish town of Halabja in eastern Iraq was gassed. The atrocity was but part of a wider campaign against the Kurds, which had its own name - the "Anfal". Saddam Hussein did not trust them. He accused them of wanting a separate state and of helping the Iranians with whom he was at war. Reporters who penetrated the Kurdish region of northern Iraq after the defeat of Saddam Hussein in Kuwait in the first Gulf War of 1991 found a wasteland. Village after village had been destroyed. Piles of rubble told where houses had been. In the midst of the destruction there lay a splendid palace built by Saddam Hussein for himself. 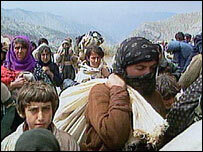 Thousands of Kurds fled into the mountains of southern Turkey as Saddam Hussein fought to regain control. Tolerated but not welcomed by the Turks, they huddled in "safe havens" set up by British and American troops until they could return and try to rebuild. In the south, the Shias, encouraged by a call to arms by the then US President George Bush senior, rose up. But there was no help from outside and Iraqi helicopter gunships established the control by violence that was the hallmark of Saddam Hussein's rule. It is no wonder therefore that the Kurds and the Shias will not shed tears for him. Some, many even, among the Sunni population will. Saddam had his power base among them and they powerfully support the insurgency. To them he was an Iraqi hero who had overthrown the old ways and had given them pride. Others, especially the middle classes of all backgrounds - might look back to the days when they could walk the streets and drive around the country with no fear of being blown up. But these families too had suffered. During the eight-year war Saddam Hussein had launched against Iran in 1980, hundreds of thousands of Iraqis (and probably even more Iranians) died. Iraq used nerve and mustard gas against Iranian forces. He was at the time supported by the Western powers, who were most concerned to contain revolutionary Iran, and the Soviet Union. But the Kuwait invasion was followed by years of deprivation and isolation under UN sanctions. 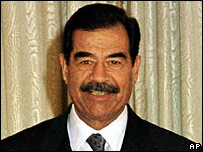 Saddam Hussein never ruled over a land at peace and at ease with its neighbours and the world. His execution marks the end of a chapter. But it does not mark the end of the chaos that Iraq faces. His fate has become almost a sideshow in the great struggle now unfolding in Iraq. His dying wish, expressed in a letter written in jail, called for Iraqis to unite. They are unlikely to listen. The Bush administration, struggling to set a new course in Iraq, will try to make capital out of Saddam Hussein's removal. But it was thought when he was captured in December 2003 ("We got him," declared the American administrator Paul Bremer) that it would demoralise the insurgency. It did not. And nor will his death. The future of Iraq and its place in the Middle East remains to be determined by players other than Saddam Hussein.